(June 8, 2012) The New York City Amateur Radio Emergency Communications Service (NYC-ARECS), a NYC based auxiliary communications organization, is looking for a few good men and women to join their emergency communications team. 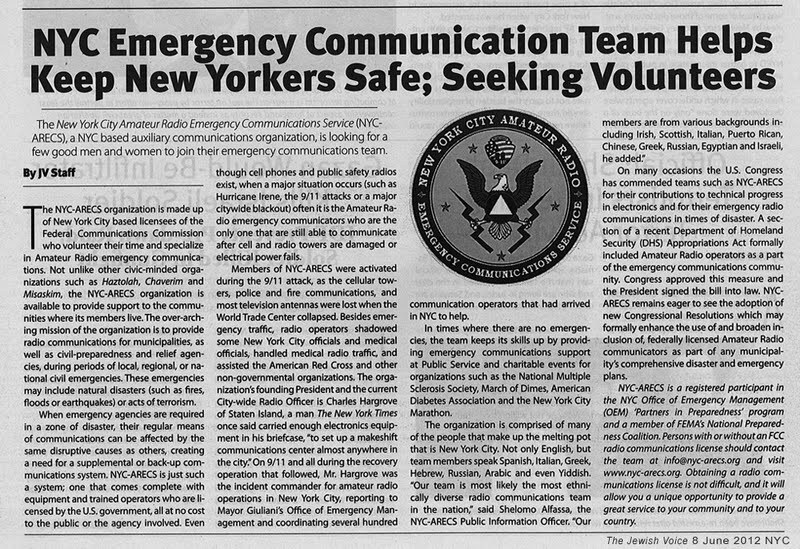 The NYC-ARECS organization is made up of New York City based licensees of the Federal Communications Commission who volunteer their time and specialize in Amateur Radio emergency communications. Not unlike other community minded organizations such as Haztolah, Chaverim and Misaskim, the NYC-ARECS organization is available to provide support to the communities where its members live. The over-arching mission of the organization is to provide radio communications for municipalities, as well as civil-preparedness and relief agencies, during periods of local, regional, or national civil emergencies. These emergencies may include natural disasters (such as fires, floods or earthquakes) or acts of terrorism. When emergency agencies are required in a zone of disaster, their regular means of communications can be affected by the same disruptive causes as others. That creates a need for a supplemental or back-up communications system, one that comes complete with equipment and trained operators who are licensed by the U.S. government, all at no cost to the public or the agency involved. Even though cell phones and public safety radios exists, when a major situation occurs (such as Hurricane Irene, the 9/11 attacks or a major citywide blackout) often it is the Amateur Radio emergency communicators who are the only one that are still able to communicate after cell and radio towers are damaged or electrical power fails. Members of NYC-ARECS were activated during the 9/11 attack, as the cellular towers, police and fire communications, and most television antennas were lost when the World Trade Center collapsed. Besides emergency traffic, radio operators shadowed some New York City officials and medical officials, handled medical radio traffic, and assisted the American Red Cross and other non-governmental organizations. The organization's founding President and the current City-wide Radio Officer is Charles Hargrove of Staten Island, a man The New York Times once said carried enough electronics equipment in his briefcase, "to set up a makeshift communications center almost anywhere in the city." On 9/11 and all during the recovery operation that followed, Mr. Hargrove was the incident commander for amateur radio operations in New York City, reporting to Mayor Giuliani's Office of Emergency Management and coordinating several hundred communication operators that had arrived in NYC to help. In times where there are no emergencies, the team keeps its skills up by providing emergency communications support at Public Service and charitable events for organizations such as the National Multiple Sclerosis Society, March of Dimes, American Diabetes Association and the New York City Marathon. The organization is comprised of many of the people that make up the melting pot that is New York City. Not only English, but team members speak Spanish, Italian, Greek, Hebrew, Russian, Arabic and even Yiddish. "Our team is most likely the most ethnically diverse radio communications team in the nation," said Shelomo Alfassa, the NYC-ARECS Public Information Officer. "Our members are from various backgrounds including Irish, Scottish, Italian, Puerto Rican, Chinese, Greek, Russian, Egyptian and Israeli," he added. On many occasions the US Congress has commended teams such as NYC-ARECS for their contributions to technical progress in electronics and for their emergency radio communications in times of disaster. A section of a recent Department of Homeland Security (DHS) Appropriations Act formally included Amateur Radio operators as a part of the emergency communications community. Congress approved this measure and the President signed the bill into law. NYC-ARECS remains eager to see the adoption of new Congressional Resolutions which may formally enhance the use of and broaden inclusion of, federally licensed Amateur Radio communicators as part of any municipality's comprehensive disaster and emergency plans. NYC-ARECS is a registered participant in the NYC Office of Emergency Management (OEM) 'Partners in Preparedness' program and a member of FEMA's National Preparedness Coalition. Persons with or without an FCC radio communications license should contact the team at info@nyc-arecs.org and visit www.nyc-arecs.org. Obtaining a radio communications license is not difficult, and it will allow you a unique opportunity to provide a great service to your community and to your country.